As a little bit of background, my uncle Jim (mom’s brother) is ex-Air Force (God bless our military! ), and was stationed in Germany for five years in the eighties. I was fortunate enough to go over and visit him with my grandmother when I was a child, and I know that he really enjoyed a lot of things about Germany – especially the food! Jim is tall and lean, but he sure can pack away some food! So, earlier this week, when his sixtieth birthday came about, Jim came to Ohio to visit, and my parents made reservations at a local German restaurant to honor Jim as he entered into his sixth decade. My parents, my brother, my mom’s/Jim’s cousin and her husband, and I were to feast on German fare on the west side of Cleveland. As many of you have read in my tweets, my mom broke her leg earlier this week, so she wasn’t able to join us. But, she insisted that we go out and celebrate properly with Jim. So…we did! We arrived at Der Braumeister, a bar that is named top twenty in the nation by Men’s Health magazine, at 7PM on Friday night. 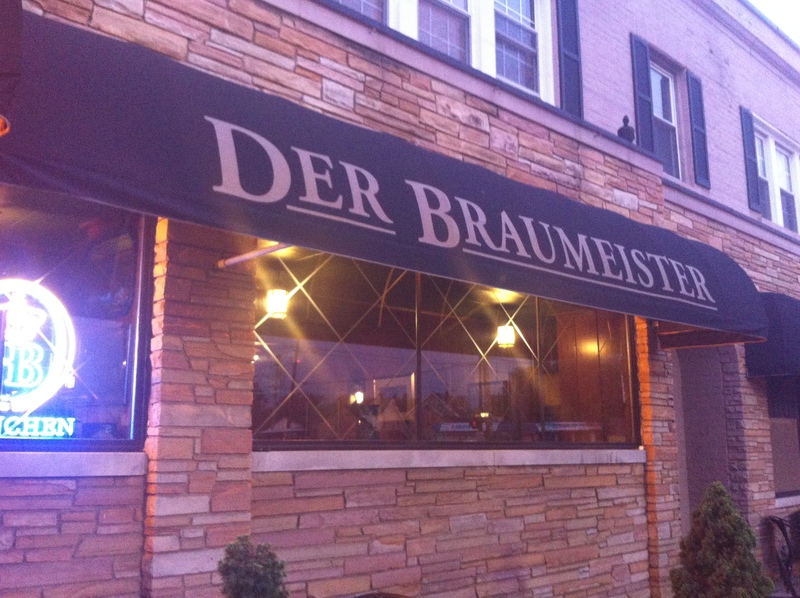 Der Braumeister – at the corner of Lorain Ave and 131st St.
It’s the best looking building in the neighborhood – which doesn’t actually say much, but it IS a charming place! 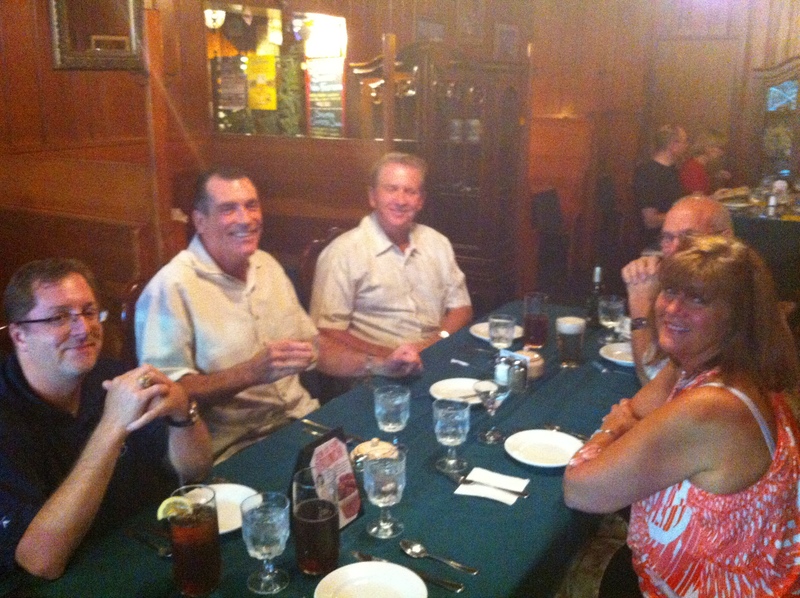 We met our cousins at the bar, and were promptly seated at a large table in the next room. We perused the beer list and the menu, and I instantly knew that I would have our server choose for me. Our server was Kelsey, and she was a firecracker, but more about her later! From front left, clockwise: Adam (brother), Jim (uncle), Terry (dad), Mike (cousin), Sandy (cousin) – and, me behind the camera…my preferred position! She came back a few minutes later and told me what she planned to serve me, and wanted to make sure it was okay. After I joked with her that she had ruined the surprise, she quickly stepped up and said she would change the order and surprise me. 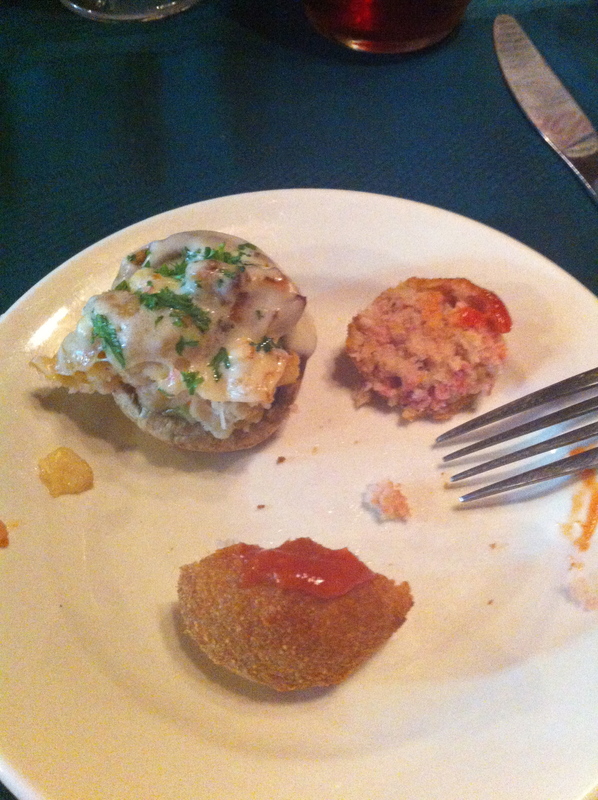 In the meantime, we shared appetizers…crab-stuffed mushroom caps and sauerkraut balls – both really delicious! Along with amazingly light and fresh bread. Then, came soups and salads. Now, the salads created quite the comedic theme throughout the night. I’m hoping this isn’t a “you had to be there” anecdote, but it may be. Uncle Jim (birthday “boy”) was asked what kind of dressing he’d like on his salad. Kelsey’s response (without skipping a beat): we have poppy-seed. WTH?? She said it as though poppy-seed were a close alternative to honey mustard – not so much, Kelsey! She realized it later, and admitted to having felt pretty stupid about it. This was a joke that continued throughout the course of our evening. Mind you, Kelsey is very animated and has a killer sense of humor – I wished I had caught her on video throughout the night! 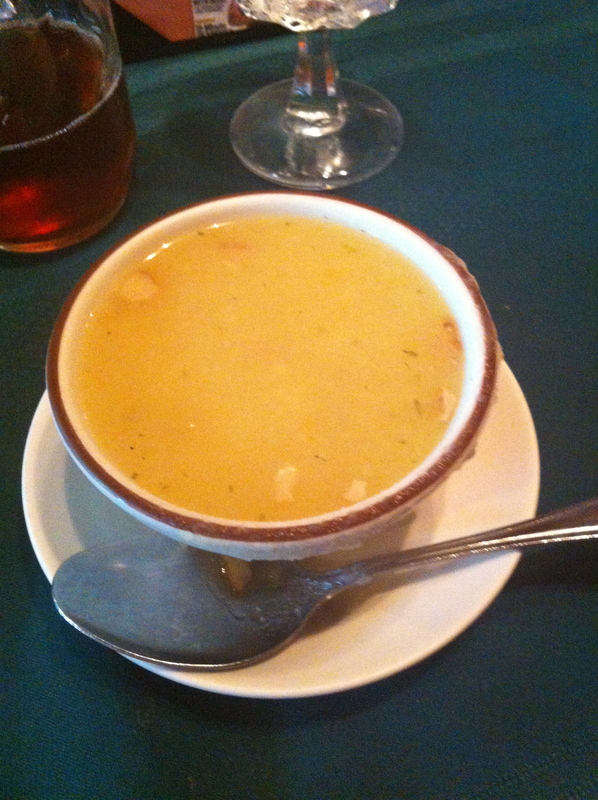 While my family ate their salads, I was served a cup of German potato soup. It looked like apple sauce; it had that texture (small bites of potato, rather than large chunks), but it tasted like the bacon-y potato soup that it was. It was quite tasty. Then, for dinner, Kelsey had promised me she was ordering her personal favorite dish. We all tried something different at the table, and unanimously agreed that the dinners were fantastic and very authentic. 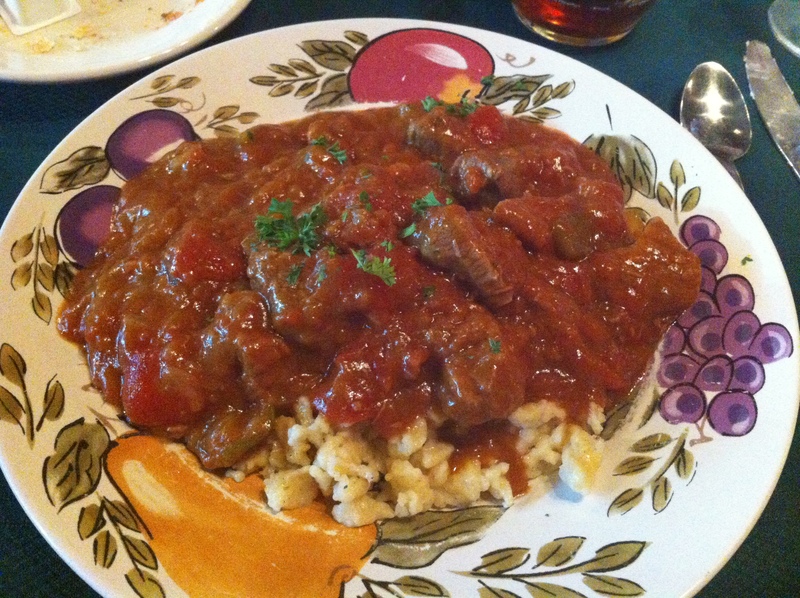 I was able to get through almost half of my plateful of Hungarian Style Goulash (tender pieces of beef simmered with green pepper and tomato in a thick gravy and served over spaetzle). The meat fell apart on the fork – it was that tender! The vegetables gave a great flavor and texture to the gravy, and the spaetzle were perfectly crispy and tender at the same time. I was more than happy to have the leftovers packaged up to go. Initially, I wasn’t going to have dessert (because I was comfortably full), but Kelsey sold us on a few items. My cousin’s husband had the Bavarian creme torte, she had the apple Strudel, my uncle tried the cherry Strudel, and I had Kelsey choose. She had earlier mentioned that the apple Strudel was her favorite, so we were all expecting her to bring me that. However, Kelsey pulled a fast one on me! She brought me the MOST. DELICIOUS. GERMAN. CHOCOLATE. TORTE. EVER MADE!!!!! To me, the torte was very reminiscent of Tiramisu – a fave of mine (even though I typically loathe anything related to coffee!). 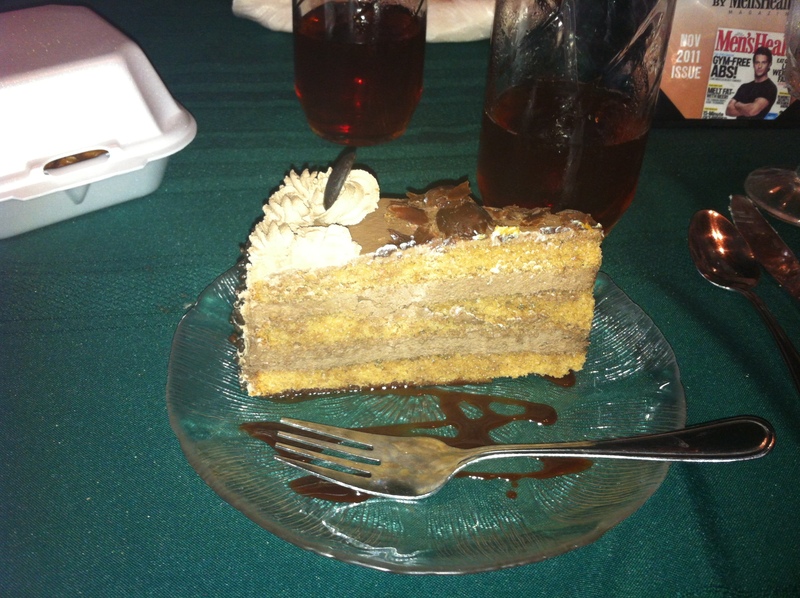 It had a mousse-like filling, and the cake part of it was very moist and light (like the delicious, but ick – espresso, did I mention I hate espresso – soaked lady-fingers in Tiramisu). I had everyone take a bite (dad dutifully had 3 – one for him, one for Adam (gluten-intolerant, poor bro! ), and one for mom (aforementioned hospital patient)), and then I finished the rest of the slice off. It was THAT GOOD! I also told my dad that we need to have Katie (from this post) learn how to make this – and ration it out to me so I can enjoy the cake, but ensure that I don’t gain 400 hundred pounds! It was such a great evening, and my uncle thoroughly enjoyed his meal <– That was the most important part for all of us! As I mentioned earlier, our entire family ADORED Kelsey. She rolled with the punches, and also punched right back! An absolute delight of a server at Der Braumeister. If you’re in Cleveland, and looking for a beer, a small front patio, fun (and good) service, and/or GREAT German food, please swing by. We all really enjoyed our first experience there very much. Sehr Gut! Thanks for the post! Never been, and it sounds like I should. I definitely think so! If you like German food and beer, I say it’s a must-visit!! I’ve been going there on and off for over ten years. The food is always consistently good & staff is great. Can’t beat the beers. It is a true Cleveland treasure and well kept secret. Thanks, J.D. It certainly was a secret to my family, but hopefully, this post helps get the word out! I not only appreciate you reading this post, but more importantly, that you shared your experiences! Awesome of you. Count me amongst those out-of-town converts, Tim! Thanks for reading/commenting.